Not to be confused with Prince George County, Virginia. King George County is a county located in the Commonwealth of Virginia. As of the 2010 census, the population was 23,584. Its county seat is King George. The county's largest employer is the U.S. Naval Surface Warfare Center Dahlgren Division. 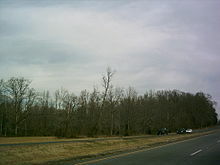 It is adjacent to the two-lane, 2-mile long Harry W. Nice Memorial Bridge carrying U.S. Highway 301 over the Potomac River. It contains the ZIP codes 22448 (Dahlgren) and 22485 (all other areas within King George). It is within the area code 540 and contains the exchanges: 775, 644, 663, and 653. Indigenous peoples of varying cultures lived along the waterways for thousands of years before Europeans arrived. Among the historic Native American tribes who came into conflict with the English were the Algonquian-speaking Nanzatico. In 1704 colonists retaliated for the tribe's attacking the farm of John Rowley, "known for his disputes" with them. They captured and shipped 40 people, including children older than 12, to Antigua in the Caribbean, where they were sold into slavery. King George County was established in 1720 when land was split from Richmond County, Virginia. The county is named for King George I of Great Britain. It was substantially reorganized in 1776 and 1777, with land swapped with both Stafford and Westmoreland Counties to form the modern boundaries. On March 16, 1751, James Madison, the fourth President of the United States, was born in Port Conway in southern King George County at Belle Grove plantation, the childhood home of his mother, Eleanor Rose "Nellie" Conway, the daughter of its owner, Francis Conway, for whom Port Conway was named. Two-time Governor of Virginia, William "Extra Billy" Smith, was born at Marengo in 1797. On May 1, 1861 during the American Civil War, Confederates installed artillery at Mathias Point in order to blockade the Potomac River. On June 27, the steamer Thomas Freeborn bombarded Mathias Point in an attempt to drive away the soldiers who were manning the weapons. Confederate soldiers fired back from Mathias Point, striking and mortally wounding Commander James H. Ward of the Freeborn, who became the first Union naval officer to die in the Civil War. While trying to elude Union cavalry, John Wilkes Booth and David Herold crossed into the county from Maryland on April 21, 1865 after assassinating US president Abraham Lincoln. Booth and Herold landed at the mouth of Gambo Creek, before meeting with Confederate agents, who guided their passage to Port Conway, where they would cross into Port Royal, in Caroline County, Virginia. According to the U.S. Census Bureau, the county has a total area of 188 square miles (490 km2), of which 180 square miles (470 km2) is land and 8 square miles (21 km2) (4.3%) is water. King George County is located on the Northern Neck and is bounded on the north by the Potomac River, which lies in Charles County, Maryland. It is bounded on the south by the Rappahannock River across which lie Caroline and Essex Counties; on the east by Westmoreland County and on the west by Stafford County. As of the census of 2010, there were 23,584 people, 9,411 households, and 4,525 families residing in the county. The population density was 93 people per square mile (36/km²). There were 6,820 housing units at an average density of 38 per square mile (15/km²). The racial makeup of the county was 76.7% White, 17.9% Black or African American, 0.5% Native American, 1.2% Asian, 0.1% Pacific Islander, 0.8% from other races, and 2.9% from two or more races. 3.3% of the population were Hispanic or Latino of any race. There were 6,091 households out of which 38.00% had children under the age of 18 living with them, 59.50% were married couples living together, 10.50% had a female householder with no husband present, and 25.70% were non-families. 20.40% of all households were made up of individuals and 6.00% had someone living alone who was 65 years of age or older. The average household size was 2.70 and the average family size was 3.12. In the county, the population was spread out with 27.80% under the age of 18, 8.20% from 18 to 24, 31.70% from 25 to 44, 22.70% from 45 to 64, and 9.60% who were 65 years of age or older. The median age was 35 years. For every 100 females, there were 101.00 males. For every 100 females age 18 and over, there were 99.40 males. The median income for a household in the county was $49,882, and the median income for a family was $55,160. Males had a median income of $38,600 versus $26,350 for females. The per capita income for the county was $21,562. About 4.40% of families and 5.60% of the population were below the poverty line, including 6.10% of those under age 18 and 6.40% of those age 65 or over. King George is represented by Republicans Ryan T. McDougle and Richard H. Stuart in the Virginia Senate, Republican Margaret Bevans Ransone in the Virginia House of Delegates, and Republican Robert J. "Rob" Wittman in the U.S. House of Representatives. The King George Fall Festival is held the second weekend of October in King George. All proceeds from this event go to support the Volunteer King George Fire & Rescue. The Fall Festival also includes a parade through town, a carnival, a craft fair, a car show, a dance, a 5-K run, and the Fall Festival Queens Pageant. The King George Fall Festival began in October 1959. ^ "State & County QuickFacts". United States Census Bureau. Archived from the original on July 13, 2011. Retrieved January 3, 2014. ^ "King George Fall Festival". King George Fall Festival. Retrieved December 16, 2016. ^ Schulz, Kathryn (May 18, 2015). "Outside In". New Yorker. Wikimedia Commons has media related to King George County, Virginia.